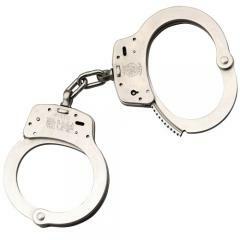 Over the years, the original Model 100 series Smith and Wesson handcuffs have become a standard piece of police equipment for many law enforcement agencies. Smith and Wesson supply the finest profesional quality handcuffs to police worldwide. These Smith and Wesson handcuffs are made with heat treated internal lockworks, featuring smooth ratchets for swift cuffing and double locks to prevent tampering (teeth in opposing directions as well as key). Smith and Wesson handcuffs meet or exceed demanding US National Institute of Justice tests for workmanship, strength, corrosion and tamper resistance. From the original Model 100 series handcuffs to the invariable durability of their restraint chains and leg cuffs - Smith and Wesson handcuffs are a proven worldwide leader in handcuff and restraint production. Smith & Wesson make the most reliable cuffs on the market. Smith and wesson you can't go wrong with them. Great cuffs, been using them for 15 years. Can never go wrong with S&W Great cuffs. Top of the line at a good price. I like them, but a little to small. Great quality. Sturdy and durable. Fast and easy to order and delivery came quickly. I love these handcuffs. I have already used them many times and they work great. It is a good product. Iam very happy with it.